One of the premier destinations for campers and outdoor lovers is tucked away between Petoskey and Harbor Springs--the Petoskey State Park. What was once the Petoskey Bathing Beach, a park for the city of Petoskey, is now a state park with all the amenities plus a spectacular beach area. The park offers year 'round activities ranging from camping to biking to swimming to hiking to cross country skiing. Picnic areas, camping areas, marked trails, miles of beach, a beach shelter, playground, and summer recreational activities are on hand for visitors in the 304-acre park. The park land was originally deeded to Pay-Me-Gwau under an Odawa Indian treaty in July of 1855. Later, much of the land was the site of the W.W. Rice Company. 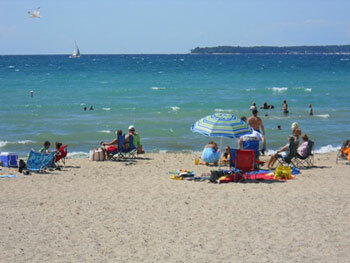 In 1934, the City of Petoskey purchased the land and named it the Petoskey Bathing Beach. In April 1968, the beach was sold to the State of Michigan. The campground opened its sites to its first campers in July 1970. Camping The park has two separate campgrounds. 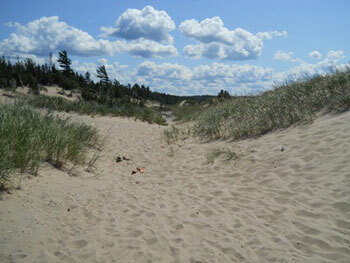 Tannery Creek offers 98 campsites plus two mini cabins and Dunes offers 80 campsites. All of the sites have electric hook-ups and modern bathroom and shower facilities. The day use area has picnic tables and grills, a playground and a one mile long beach for sunbathing. Trails Two trails run through Petoskey State Park. Old Baldy Trail includes a stairway that leads up Old Baldy, a stable dune that is one of the attractions in the park. After climbing the dune, the view that is available of the bay is breathtaking. The Portage Trail winds through very diverse terrain where a nature lover may find different species of plants and wildlife. Picnics Several picnic areas are located throughout the park. Tables with some grills are available with grills. Beach What a beach this is! With spectacular dunes, soft sands, and waves ranging from gentle to wild, this is the place to be. Beach walkers have lots of beach area to roam. "Water walkers"--walking in the shallow areas--should bring beach shoes as the area can be rocky. Kids love this beach because of the shallow areas and floating on tubes is often a great way to spend the day. Petoskey Stones This is the place for Petoskey Stones! Walkers on this beach are often seen with heads down--looking for the fossils that are found here. Because the park is at the end of the Little Traverse Bay, the rocks tend to congregate here. Park Activities The park staff offers a variety of activities including walks and more. Also see www.VisitMichiganUpNorth.com for more about our Northern Michigan lakeshore!